Just when we thought Facebook was getting too involved , Google, everyone’s favorite search engine that could, has decided to up the ante  with its new “Street View” feature. You want something creepy, try looking up your house. Yes, see that? That’s your front door. And if you were outside at the wrong time, then yes, that would be you having a smoke on the porch. When we zoomed out to a full sized map  it showed that the stalker service currently only pertains to areas around New York City, Miami, Denver, Las Vegas and our own lovely city by the bay, San Francisco. According to Macworld , the feature will be expanding to more cities sometime soon. We appreciate it: If people in Ohio can look at our front door on the internet, we certainly expect the courtesy of being able to look at theirs. Although we’re not sure why we’d want to. 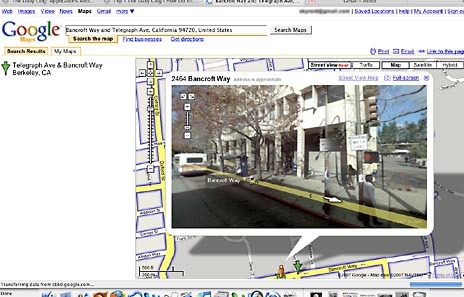 ZDNet picked up the scent  after Google registered the domain name “googlestreetview.com” along with a number of variations. The general consensus of web buzz was that Google would be debuting some kind of new feature for the O’Reilly Where 2.0 Conference , with speakers and events about mapping and geospace (a.k.a. How Big Brother Will Be Watching You In 20 Years 101). While the conveniences of this feature are fairly obvious (“No, Mom, I’m in the house with the red door. Just look it up online.”), we’ve got to say that it’s freaking us out quite a bit. Granted, it’s not like the maps are a live feed, but at some point we really have to ask what’s necessary and what’s just unnerving.